Philippine Airlines Promo 2019 - 2020: PAL x Star Cruises Fly Cruise package! Sailing dates: May 8 – October 28,2016 *Except for Libra valid till August 8,2016 sailing date only ex-Xiamen. 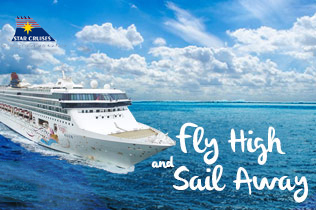 7 Night Cruise on SuperStar Virgo for as low as USD 1318! 3 Night Cruise on SuperStar Gemini for as low as USD 818! 2 Night Cruise on SuperStar Gemini for as low as USD 688! 3 Night Cruise on SuperStar Aquarius for as low as USD 1058! 5 Night Cruise on SuperStar Libra for as low as USD 1058! 4 Night Cruise on SuperStar Libra for as low as USD 948! * Above rates are in US Dollars and is based on twin-sharing in an Inside Stateroom cabin category. * Rates may vary depending on the cabin category available on the time of booking; cabin is subject to availability as it is capacity controlled. * NOT all cabin categories can accommodate triple and/or quad sharing. * Star Cruises reserves the right to change or modify the itinerary any time.